December 07 - Our late November holiday somehow wrong footed us for the run up through December to the Christmas climax and we never really got into the swing of the seasonal goodwill - not that Steve ever does. It wasn't helped by Jane catching a very severe cold in the first week of the month and she missed going swimming for several weeks whilst she recovered. It was one of those colds that you think it's getting better and then suddenly it returns with a vengeance. Of course Steve didn't survive and he spent one weekend feeling very unwell and half the time he stayed in bed, but neither of us missed any work. 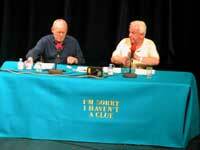 At the beginning of the month we travelled over to Peterborough on a Monday night to see a recording of Radio 4's "I'm Sorry I Haven't a Clue". This is not the first time we've watched a recording but it is always such good entertainment it was worth the hour long drive to get there. Peterborough was in festive spirit and looked beautifully decorated - much prettier than Northampton. We were fortunate because although Tim Brooke-Taylor was not on the panel he'd been replaced by Jack Dee which was a real bonus. So after an hour and much laughter we were quite worn out but ready for a break before the second show was recorded. The second show recording is always slightly less boisterous but by then not only are the team tired the audience are exhausted with so much laughing. We left Peterborough around 11pm and were home just after midnight with very little traffic to get in the way of the Audi TT without breaking any speed limits (yeah right). 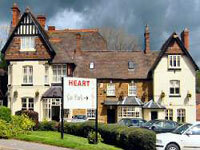 For Kate' belated birthday she and Martin took us to the Heart of England pub on the A45 in the centre of Weedon. It has a pleasant, open atmosphere and the food is reasonable considering there are two meals for the price on one - always a major attraction. It was a Friday evening, Steve was tired and Jane had been on a late shift at the surgery and was not feeling great with the cold virus so we were last to arrive but we had a great evening. It's difficult for us to get to the cinema because of Jane working late and generally being busy. Of course if we go to the cinema later than 7 pm then there's little chance of Jane staying awake long enough to see all of the film however we did manage to get one visit in this month. 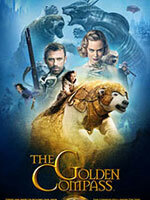 The Golden Compass is an adaptation of Philip Pullmans Northern Lights, part of the "His Dark Materials" trilogy. Interestingly the book was called Northern Lights in the UK but The Golden Compass in USA, perhaps the Americans don't have an understanding of Northern Lights or Aurora Borealis because they're so insular. Anyway the film was a great representation of the first book in the trilogy and although it only covered two thirds of the first book it was excellent with great CGI animation alongside the acting. If anyone is thinking of going to see it we would recommend reading the books first because the story might be difficult to follow. 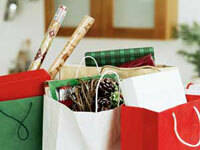 Of course December wouldn't be December without Christmas shopping and these days that holds true for October and November. In the same way that before December is over the sales have started and people are trampling over each other for the non existent bargains. Steve gets very down at this time of year because he knows that his inner child, with ludicrous expectations, will get all excited about Christmas Day only for it to be dashed when he opens his presents. On the other hand Jane gets all tense trying to satisfy the needs of everyone - whether it be designing our Christmas card or making sure that all our friends and relatives will get something they want and value. We all go through this every year and even when we collectively say we're not going to do this next year it can be guaranteed that in December 2008 we will all be doing the same thing. After opening our Christmas Day presents in the morning and phoning friends and relatives across the planet we wrapped up warm and walked across the fields and along the canal to get into Northampton for our dinner with Sue & Graham. Every year the usual suspects take it in turns to host Christmas dinner and in February of this year Sue & Graham decided it was their turn but before they would be ready they needed to redecorate their large front room that at one time had a snooker table in it. They also wanted to completely gut their kitchen and have a new one fitted. So after much work, worry and hassle they were finally ready but it was a close run thing. Their house is renown for always being on the cool side and therefore they were determined to make sure everyone was as warm as toast. 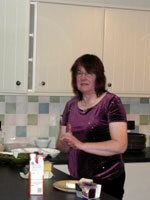 As you can see Sue is busy preparing dinner in her new kitchen. We arrived just after 2 pm and Steve started on the red wine because walking makes you thirsty, he then proceeded to keep drinking, including champagne with the dinner and several whiskies as aperitifs. As the midnight hour approached Steve was beyond happy and into sleep mode. As always Jane was busy taking pictures and helping out wherever she was needed. Steve bought himself for Christmas a Sony sound system which includes a 80Gbyte hard disk that will hold 40,000 tracks once he has had time to copy all the CDs. The device also connects to the computer network and onto the internet so it can find the names of tracks and albums when they are being loaded onto it - very clever. 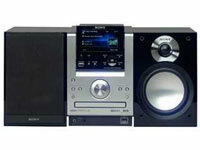 As it's a Sony it means we can download the tracks from our Sony MP3 players straight onto it. There is a down side to this because up until now Sony's MP3 players have used a special format called ATRAC3 rather than MP3 and in their wisdom Sony have decided to go more "open source" and use Windows Media software for transferring and synchronising tracks but Windows Media Player doesn't recognise Atrac3 formatted music files. As we have both been unwell we haven't been out walking at the weekends as we normally do at this time of year but we did manage to go for a walk between Christmas and New Year. For a change we drove to Flore, parked up and walked up to the Grand Union Canal and then all the way along it into Weedon. It was an overcast day with nothing special about it but just walking and talking is very enjoyable. 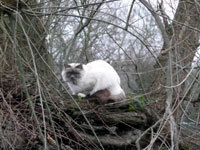 We took time out to watch this fluffy cat who was nesting in the crook of this willow tree, looking very like the Cheshire cat, Lewis Carroll fashion - it never fails to amaze us how long a cat will sit watching and waiting for something to happen. Perhaps cats are amazed by us humans who are for ever dashing about looking hither and thither for something but missing all of the subtleties that are right in front us if only we took the time to wait and watch.